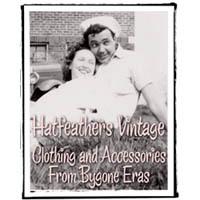 Hatfeathers Vintage specializes in vintage clothing for men and women from the 1940s to 1960s, some of the greatest years for fashion, however, our website is stocked with wonderful goodies from all eras. We also have a broad selection of accessories such as hats, shoes, scarves, and jewelry, plus childrens vintage, vintage fabric and sewing notions, and great retro housewares and linens. Last Updated: Sep 1, 2018 Listing Expires: Sun Sep 1 18:25:56 2019 This listing has been viewed 6168 times.